I have a growing obsession with pleated skirts as of late. Ever since I saw my style girl crush Jane Keltner De Valle rocking her green Gucci one at Fashion Week, I felt inspired to try the look myself but didn’t know where to start. That’s when I saw Taylor Swift wearing this one on Live with Kelly and Michael….then a while later I saw Kelly wearing it on her show talking about how she had copied Taylor. And here I am copying both of them! A glittery rainbow pleated skirt in all of it’s glory. I seriously can’t get enough of it so don’t be surprised if you see it again later this Spring with a tank and then again in the Fall and Winter. 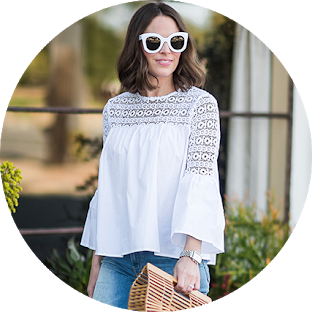 There are a few items that I love so much in my closet (here and here are a few examples) that I wish I could wear them all.the.time. Walking our dog in a furry pink jacket? Totally normal, right? This skirt is one of those items. In fact, I’m going to go put it on right now. It’s those precious gems that are worth the investment because if you love it that much, it will be with you for years. Just to hammer my point home further…I got my Rockstuds three years ago and still wear them all the time (I scored them at Nordstrom Rack BTW…just imagine my Oprah’s Favorite Things public reaction when I saw them on the shelf. You’ve seen the SNL skit right? I’m the one with her head popping off). What are your favorite things in your closet? Have a great weekend and as always, thank you so much for following along!